Break up one of the bulbs of garlic and peel all the cloves. Put these in a food processor with the soy sauce, 30ml olive oil, paprika, ginger, crushed chillies and the juice of one lemon. Process until you have a smooth sauce. Cut some slashes into the tops of each of the chicken thighs. In a large bowl, toss the thighs with the chilli and oil mix and some black pepper then put the thighs in a large roasting tray. Slice the celery into chunks. Peel the garlic and onion and slice with the remaining lemon. Cut the chilli in half lengthways and put it in with the chicken, along with the celery, lemon slices and peeled garlic. Roast in the oven for 40-45 minutes then check the chicken is cooked through. 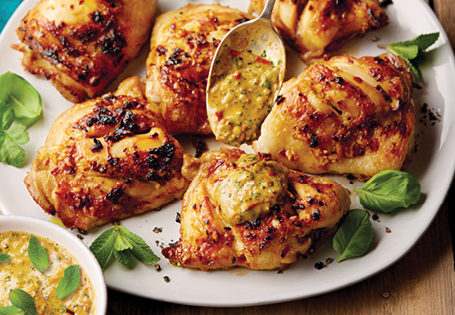 Drizzle the salsa over the chicken and garnish with fresh Basil.